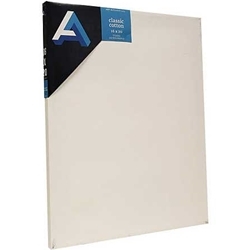 Art Alternatives Studio Stretched Canvas Natural, unbleached medium-weight cotton duck is stretched around specially designed, kiln-dried stretcher bars, and held in place with a flexible spline allowing these canvases to be painted on all four edges as well as the canvas surface. The surface is triple-primed with acid-free acrylic titanium gesso and staple-free on the sides. Studio Stretched Canvas features a 7/8" edge and is suitable for oil and acrylic painting.